I have made myself at home in my new job. You can probably see at least one TARDIS, but there are two and a sonic screwdriver. You might see a Wonder Woman figure, but there are also two Wonder Woman logos. There is a Garbage Pail Kid and a Pokemon. If you look really hard you might see a Tribble. Too much? Not enough? It is truly a matter of opinion. I would like to have something from each of my favorite fandoms, but this works for now. 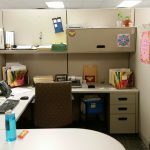 Geeking at work, or “letting your Geek flag fly” is something I started doing the first time I had a job with my own office space. It is important to me and helps me focus when I have an organized environment and I can express myself. I am a social worker, this means I work with a lot of people and the nature of my work means I have to connect with people and still maintain professional boundaries. Sharing my Geekiness is a way to connect without being fake and not getting too personal. I don’t display pictures of my kids or my partner and you won’t see symbols of my faith or political affiliation. I’ve had positions with varying amounts of interaction with people. When I don’t have a lot of contact, decorating my space with the Geeky things I love is just for me. It makes me happy and helps provide a calming element to a sometimes stressful environment. It also allows co-workers a little insight into who I am and helps with those initial conversations. When I do have clients in my space the figures, models, and pictures provide an opportunity to connect. I have had clients point to something and tell me they like it or start a conversation about something Geeky they enjoy. Sometimes they don’t say anything, but after a few moments in my space they will get comfortable and begin to open up. I would like to think I am just a charming individual and easy to talk to, but I believe putting a little of myself on display invites connection. If you’re a little awkward like me, connecting with new people is hard and I look for things to help make small talk easier. When I am in a position where I meet new people all the time and I have to gather information, that is at times personal, I like to do what I can to make it less awkward for them. Some people can’t bring personal items to work. To them, I would say to occasionally incorporate something Geeky into your wardrobe. A Star Wars or Doctor Who tie, a necklace/ring/bracelet, or socks even if most people won’t notice some will. For some people, Geeking at work also includes their car. Geeky window decals are amazing. I have a Wonder Woman logo and Princess Leia. I have seen a few others I like but I’m being selective because there is only so much room on the back window of a hatchback. Seat covers, license plate holders, and bumper stickers also have Geeky themes. Are there rules to geeking at work? No, but I do have a few words of caution. Don’t overdo it with one fandom. You can have a favorite, but think of grandma’s kitchen that is COVERED in everything Coke-a-Cola. Too much makes you look a little crazy. It is okay to bring in something that is less known and even obscure, but only if you want to explain what it is 100 times. I would LOVE a figure from Spirited Away, Ponyo, or Howl’s Moving Castle, but not sure I would want to explain any of them to someone who doesn’t get that kind of Anime. Don’t bring anything in that is worth a ton of money. If it was lost/stolen/broken would you be a little upset or would you be distraught. 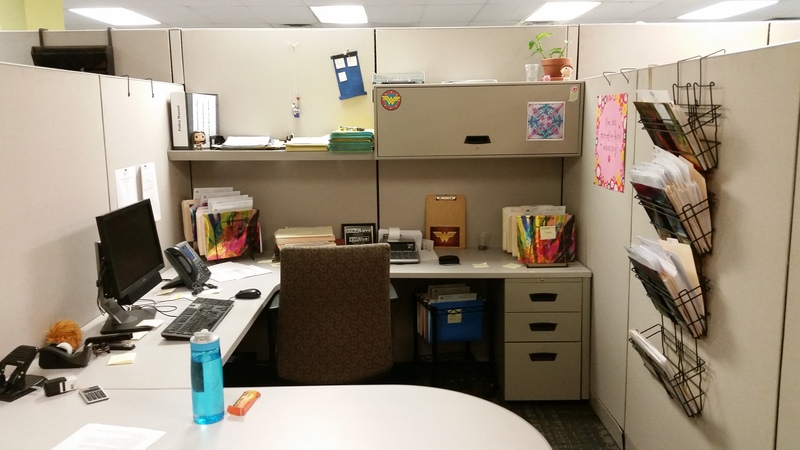 How have you let your Geekiness show at work? Has it affected the way you interact with coworkers and clients? Can you think of anything I missed? Have any stories to share? I’d love to hear from you!